TD Garden policies from A-Z. The Absolut Lounge, part of the Boston Garden Society, is located on Level 5 and has a large bar, plasma televisions, and a great view of the action. Club Seat ticket holders have access to this area to mingle and enjoy food and beverage during all Bruins and Celtics games. The Absolut Lounge is also available to rent for private parties during other TD Garden events. For more information, call 617-624-1847. TD Garden is committed to providing accessibility and accommodation to all of our guests for their comfort, safety and enjoyment. The arena offers a variety of wheelchair and companion seating locations throughout each level. Seating locations vary depending on particular events. Please indicate when buying tickets if you require accessible seating. For more information, please visit our Accessibility page or contact the ADA info line at 617-624-1750. For detailed directions, visit the Directions & Parking page. For directions to the North Station Garage, navigate to the Nashua Street ramp located at 121 Nashua Street, Boston, MA 02114 or to the Causeway Street ramp located at 140 Causeway Street, Boston, MA 02114. To learn more about advertising opportunities at TD Garden, please contact our Corporate Partnerships department at 617-624-1835. All individuals two years of age or older must possess a valid ticket for entry into TD Garden. A child under two years of age is admitted free of charge for all events, provided that the child sits on a patron’s lap. Occasionally, a family show (Disney On Ice, Globetrotters, etc.) will require children younger than two years old to purchase a ticket. Boston’s Logan International Airport is located less than four miles away from TD Garden. This is the closest airport to the arena and is accessible by public transportation. For safety and as a courtesy to other ticket holders, patrons are prohibited from sitting or standing in the aisles. Any guest not in compliance may be subject to eviction. Alcohol is served at most TD Garden events. TD Garden staff is trained in responsible alcohol service management. International driver’s licenses are not accepted at TD Garden. A valid active military identification card with photo which proves that the patron is 21 years of age or older. A valid retired military identification card which states that the expiration is indefinite on the front and has a birth date and an expiration date printed on the back of the card. In order to be in possession of alcohol at TD Garden, guests must be able to produce valid identification. Any patron in the possession of alcoholic beverages not obtained on premises will be subject to eviction. No refunds will be offered for confiscated alcoholic beverages. Any patron who presents false identification or who passes alcohol to a minor may be subject to eviction and arrest. We will not serve more than two alcoholic beverages to a patron at one time and we reserve the right to limit service to one drink per patron. Our alcohol service will end at least one hour prior to the scheduled end of an event. We reserve the right to discontinue the sale of alcohol at any time. We will not serve any patron whom we believe to be impaired. Providing alcoholic beverages to anyone under the age of 21 at TD Garden is against the law. Violators who provide alcoholic beverages to anyone under the age of 21, as well as anyone under the age of 21 who accepts an alcoholic beverage, will be evicted from TD Garden and could face prosecution and revocation of season tickets or other privileges. Service dogs that are trained to provide services and tasks for persons with disabilities are permitted. Support or companion animals are not permitted. Guests with service dogs may not take up additional seats unless a ticket has been purchased for the adjacent seat for the service dog. Guests are advised to contact the ADA Info Line at 617-624-1750 or [email protected] to request an Assistive Listening Device at least 7 days prior to the scheduled event at TD Garden. Guests who reserve an assistive listening device ahead of time for an event must provide a major credit card, driver’s license, or state issued I.D. to ensure that the devices are promptly returned to the TD Garden Guest Services Office, located on the Level 4 concourse outside of Loge Section 4, at the completion of use. The AT&T SportsDeck, part of the Boston Garden Society, is located on Level 5 of TD Garden. Only those with tickets valid specifically for the AT&T SportsDeck are allowed entry. An AT&T SportsDeck ticket also allows access to select Boston Garden Society restaurants. For more information about the AT&T SportsDeck or the Boston Garden Society, please call 617.624.2582. Large bags, backpacks, luggage, laptops, tablets, coolers, briefcases and like articles are strictly prohibited from the facility. Patrons with prohibited articles will be turned away at the entrances and no storage or check area will be provided for such items. Enforcement will be without exceptions. Banners Harbor View is the Boston Garden Society’s fine dining restaurant, located on Level 6 of the arena. Dining in Banners Harbor View is available for the exclusive enjoyment of all Boston Garden Society ticket holders (Levels 5 & 6). Signs 8 ½ x 11” or under that adhere to the Code of Conduct are permitted inside TD Garden. TD Garden management may prohibit and confiscate signs that violate the Code of Conduct or are not event-related, excessive in size or contain indecent or derogatory comments or images, political statements, or commercial references. Signs and banners may not be hung anywhere in the Garden or displayed in any way that obstructs the view of others or advertising signage. No signs or banners with poles or sticks are permitted. Guests are welcome to bring a pair of binoculars to TD Garden to enhance their overall experience. For more information about the team and to purchase tickets, call 617-624-BEAR (2327) or visit BostonBruins.com. The Boston Bruins Foundation is a 501(c)(3) non-profit foundation that assists charitable organizations that demonstrate a commitment to enhancing the quality of life for children and their families throughout New England. We focus on organizations that are concentrated on academics, athletics, community outreach, and health and wellness. The Foundation believes that these pillars will create a strong support system that will ultimately lead to the betterment of our community. To learn more please visit BostonBruins.com/Foundation. For more information about the team and to purchase tickets, call 866-4CELTIX or visit BostonCeltics.com. The Boston ProShop is located on Level 2 of TD Garden. It can be accessed via escalators on the east and west sides of North Station or via the elevator on Level 1 of North Station. The ProShop carries Bruins and Celtics merchandise, NHL, NBA and other local team products. For more information about the ProShop, call 617-624-1500 or visit the official site. Visit bostonproshop.com to make purchases online. Guests are not permitted to carry bottles or containers into TD Garden at any time. To see all prohibited items, visit our Policies page. The TD Garden Box Office has moved to its new, permanent location on the North Station concourse. The Box Office is located between the Boston Garden Society lobby and the entrance to the new MBTA passageway. The parking garage elevators nearest to the Box Office are the East Garage elevators and/or The Hub elevators. The Box Office does not accept any incoming phone calls. For ticket-related support, visit the Box Office during regular business hours or contact Ticketmaster Customer Service at 800-653-8000. For all other inquiries, contact TD Garden Guest Services at 617-624-1331. In the rare event that a TD Garden event is postponed or canceled, please visit the TD Garden website for up-to-date information on scheduled events or call Customer Service at 617-624-1331. Non-flash, still cameras without a detachable lens are permitted at TD Garden. Professional photography equipment, including tripods, are not permitted inside TD Garden without building issued media credentials. Please note, the Event Promoter reserves the right to deny camera use at any time during or before the concert and to prohibit the use of any camera that is deemed unacceptable. Extensive private event catering services are available for corporate events, fundraisers, holiday parties, and more. For an event that involves a game or event (concert or family show) at TD Garden, call 617-624-1847. If you are looking to book a private event that does not involve tickets to an event at TD Garden, please call 617-624-1638. Garden Neighborhood Charities is the philanthropic arm of TD Garden. Its mission is to provide support, through grants, in-kind donations, volunteerism and community events, to charitable organizations and programs making a positive impact in our neighborhood of Greater Boston. To request a donation or learn more, visit the Garden Neighborhood Charities page. Club Seats, part of the Boston Garden Society, are located on Level 5 of TD Garden. Visit the Club Seating page for more information on Club Seats or call 617-624-2582. TD Garden does not provide an area to check coats or any other personal belongings. On each level of TD Garden, there are various concession stands offering many food and beverage options. Click here for a list of concessions stands and food offerings. Please note that TD Garden is not a peanut-free facility, however, food items are not cooked in peanut oil and peanuts sold at TD Garden are prepackaged. Guests with food allergies should inform their server to review the ingredients and preparation of the items. The Cross Insurance Boardroom, part of the Boston Garden Society, is located in the west end of the arena, on Levels 5 and 6 of TD Garden. Access to The Cross Insurance Boardroom is limited to patrons with Boardroom tickets. A Boardroom ticket also allows access to the Boston Garden Society restaurants and spaces. For complaints, concerns, comments, or suggestions, please email [email protected] or call 617-624-1331. TD Garden is located at 100 Legends Way. Please visit our directions page for more information. 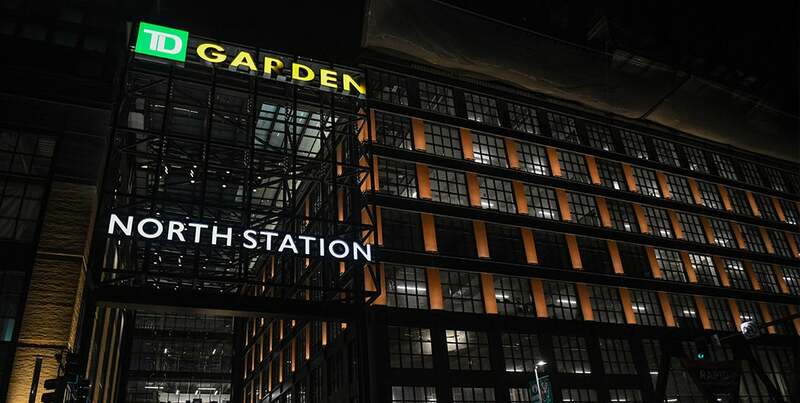 For navigation to parking at TD Garden’s North Station Garage, use the address 120 Causeway Street, Boston, MA 02114 or 121 Nashua Street, Boston, MA 02114. Delaware North is the owner and operator of TD Garden. The time the doors to TD Garden open will vary according to the event. Please check in advance by checking the event page or calling Customer Service at 617-624-1331. Unless otherwise specifically noted, the typical times are listed below. Bruins – Member Doors open two hours prior to game time. General doors open one hour prior to game time. Celtics – Member Doors open two hours prior to game time. General doors open one hour prior to game time. There are no designated drop-off or pick-up locations in front of TD Garden. If you are arranging a pickup from Causeway Street, it may be helpful to include a cross street. Elevator access to Level 2 of TD Garden is available from North Station Concourse, The Hub On Causeway and TD Garden’s North Station Parking Garage. On Level 2, there are two elevators that will provide access to all arena levels. Additional elevators exclusive to Boston Garden Society members provide access to all arena levels and the North Station Parking Garage. There is no definitive end time for concerts. Bruins and Celtics games are generally two and a half to three hours in duration. Visit the Jobs page to find out about employment opportunities at TD Garden. Due to construction, all ticketholders are advised to proceed to the West Side of North Station for entry to TD Garden. Please follow the direction of TD Garden staff and signage. Guests will have options including elevators, escalators, and stairs to access each level. A facility fee is charged to each ticket purchased to TD Garden and may vary depending on the type of event. Baby changing stations are located in all restrooms throughout TD Garden. A Family Restroom is available inside First Aid on Level 4 near Section 15/16. Nursing accommodations are also available inside First Aid. Tell any of our Uniformed Staff. Visit our Guest Services team on Level 4, Loge 4 or Level 7, Section 307. Text In Event Text Number 617-858-8626 with issue and seat location. Call In Event Fan Security Line 617-624-2FAN (2326). In addition to the Boston ProShop, there are novelty stands called Fan Zones located on Levels 2, 4, 5, and 7 in TD Garden. Here, guests will find Bruins and Celtics clothing and other items. During other events, guests can find official event-specific merchandise at pop-up stands throughout TD Garden. First Aid is located on Level 4 across from Section 15/16. Guests may not bring outside food and/or beverage items into the arena at any time. Guests must dispose of the unauthorized items prior to entrance into the arena. TD Garden will not check-in or store any food or beverage items. Guests with specific/special dietary needs due to medical conditions or religious requirements should contact TD Garden at 617-624-1331 or via email at [email protected]. Visit the Food & Drink page for more information on food and beverage items offered at the many concessions stands throughout TD Garden. The Garden Gold Card is an exclusive gift card that can be used at TD Garden and is available in a TD Garden, Bruins, or Celtics theme. Use your Garden Gold Card to purchase tickets, team gear, or food & beverage at the TD Garden Box Office, the Boston ProShop, and select concession stands within the arena. The Garden View, part of the Boston Garden Society, overlooks the action on the TD Garden parquet or ice and is the ideal hospitality space for 40-60 guests. Located on Level 6, The Garden View combines the luxury of a private executive suite with the atmosphere of an upscale sports lounge. General Admission (GA) Floor Ticket Holder: There is no pre-distribution of wristbands. All GA floor ticket holders will enter at the time of GA doors, which is typically 90 minutes prior to show start. Stairwell 4 is the primary stairwell for GA entrance and is located on the west side of the building across from Tasty Burger. TD Garden is not a 24-hour facility. Line forming, gathering and/or camping out is prohibited. *The general admission entry process and entrance location is subject to change with little to no notice. Any and all changes will be updated on the TD Garden website/app and can be viewed by clicking on the specific event on the main page of the site. General Admission (GA) Pit Ticket Holder: There is no pre-distribution of wristbands. All GA pit ticket holders will enter at the standard show door time, which is typically 60 minutes prior to show start. Legends Express door is the primary entry for GA pit entrances and is located on the west side of the building across from the Tip O’Neill Federal Building. TD Garden is not a 24-hour facility. Line forming, gathering and/or camping out is prohibited. *The general admission entry process and entrance location is subject to change with little to no notice. Any and all changes will be updated on the TD Garden website/app and can be viewed by clicking on the specific event on the main page of the site. The Bruins shoot twice at the goal in front of Sections 6 and 7, during the first and third periods. For group tickets and information, please call our Group Sales department at 617-624-1805 or email us at [email protected]. Guests will not engage in fighting, throwing objects, or attempting to enter the playing or performing surface. Guests who do so will be immediately evicted from the arena. Guests will not smoke in the arena. Guests who do so will be immediately evicted from the arena. Guests will not display obscene or indecent messages on signs or clothing. Guests will not exit and re-enter the building after scanning of tickets. TD Garden is committed to ensuring a safe, comfortable, and enjoyable experience for all guests. Visit our Guest Services team on Level 4, Loge 4 or Level 7, Section 307, email [email protected], or call 617-624-1331. The Heineken Green Room, part of the Boston Garden Society, is a seating and hospitality space on Level 5 of TD Garden. This unique seating area is fully customizable for guests who are looking for the exclusivity of a suite with the most flexible game package options. Members also receive tickets to select TD Garden concerts. Break away from the ordinary and host your next function at TD Garden. From 50 to 15,000 people, TD Garden is the place for any event. Visit our hotels page to see our partner hotels that offer special rates to TD Garden ticket holders. Located on the Level 4 concourse, The Hub Bar is a full-service bar and has a panoramic view of Boston. The Hub Bar is accessible to all guests and does not require a membership. The unique opportunity of riding an ice resurfacer requires a $150 donation to the Boston Bruins Foundation. All riders must be 12 years of age or older. For more information or to set up a ride, please call 617-624-1955. Ice resurfacer rides are subject to availability. In the rare event that a TD Garden event is postponed or canceled due to inclement weather, please visit the TD Garden website for up-to-date information on scheduled events. Should a decision be made to cancel or postpone an event, this information will be promptly posted on the TD Garden website, as well as on our main information telephone line at 617-624-1000. Guests are advised to contact the ADA Info line at 617-624-1750 or [email protected] at the time of purchase, or at least 7 days prior to the date of the scheduled event, to arrange for interpretive services. TD Garden reserves the right to deny entry to impaired guests. Any impaired guests causing a disturbance during an event will be asked to leave the facility and may be subject to arrest. Set in the heart of TD Garden, Legends is a private, members-only restaurant where guests can enjoy an upscale, yet relaxed atmosphere with an elevated dining experience. Legends opens two hours before a game and remains open one hour post- game. The Level 5 Bistro is located on Level 5 of the arena. A more casual restaurant, the Level 5 Bistro does not accept reservations and has different food stations throughout the restaurant, including pizza, deli and more. The Level 5 Bistro is usually open one hour prior to all events through the end of the event. Strobes, Lasers, Pyrotechnics, and Haze may be in use during any event. Special ticket inventory is released for various events throughout the year. Call 617-624-1847 to speak to someone from our staff to learn more. There are no public lockers or storage facilities at TD Garden. Guests can report lost items by filling out this form. Please include as much information about the item as possible in the ‘Notes’ section, such as color and physical description. If an item is turned in that matches your item, you will be contacted to verify details of the item. A form must be submitted online for all lost and found inquiries. If your item is located, pickup will be arranged at our Executive Office entrance located in North Station during normal business hours. You will be asked to present a valid photo ID for the release of your item. Unclaimed items will be discarded/donated 30 days after the date the item is turned in. Children should be directed to the nearest TD Garden staff member should they become lost. Lost children will be taken to the Guest Services Office (Level 4, Section 4). Parents looking for a lost child should go to this office as well. Please report lost persons to TD Garden Security. Guests who have lost tickets or have had tickets stolen before an event takes place should return to the point of purchase for further assistance. If you have purchased tickets through Ticketmaster, please call Ticketmaster Customer Service at 800-653-8000. Media credentials for concerts/special events can be requested by emailing [email protected]. You must be an accredited member of the media on assignment to be considered. Scoreboard Messages are available for both Bruins and Celtics games for a donation. For Bruins games, a donation of $150 to the Boston Bruins Foundation is required. For Celtics games, a donation of $50 to Garden Neighborhood Charities is required. Ten days of notice is required for scoreboard messages, including birthday messages. The official TD Garden mobile app has the latest event information, in-app ticket buying, directions, special offers and more. Visit the Mobile App page for more information. With the most convenient parking for every game and show, the North Station Garage, located directly underneath TD Garden, offers a flat event rate of $50 when you enter 2 and 1/2 hours prior to the scheduled event time. Elevators located in the parking garage will bring you directly to the main concourse in North Station. 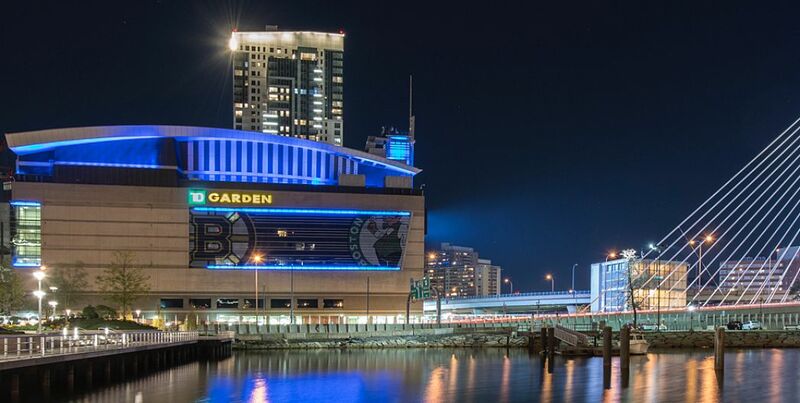 With the most convenient parking for every game and show, the North Station Garage, located directly underneath TD Garden, offers a flat event rate* of $50 when you enter 2 and 1/2 hours prior to the scheduled event time. Elevators located in the parking garage will bring you directly to the main concourse in North Station. The garage phone number for general information such as rates and height limits is 617-222-3042. There is only one payphone on Level 1, across from the Commuter Rail Ticket Booth. For a complete list of telephone numbers, please visit the Contact Us page. The Premium Club Bistro is located on Level 5 of the arena. A more casual restaurant, the Premium Club Bistro does not accept reservations and has different food stations throughout the restaurant, including pizza, deli and more. The Premium Club Bistro is usually open one hour prior to all events through the end of the event. Visit the policies page for a complete list of prohibited items. During hockey games at TD Garden, protective netting is hung above the glass behind both goals. This precaution limits the amount of pucks that leave the ice and enter the seating area. Although the netting provides some protection from injury, TD Garden reminds you to stay alert at all times. The MBTA operates the North Station commuter rail station, located on the ground floor beneath TD Garden. For more information, visit the Transportation page. Pucks that go into the stands during hockey games may be kept by the patron who catches the puck. Please note that while protective netting is put in place at each end of the rink, pucks may still go into the stands. The hockey pucks are made out of 100% vulcanized rubber and are chilled. When the pucks go into the stands it can cause serious injuries, so please stay alert at all times. Please notify a uniformed TD Garden staff member or visit Guest Services at Loge 4, Level 4 if you get hit or hurt by a puck. The Putnam Club is located next to Legends. The Putnam Club is exclusive to those ticket holders with courtside seats to Boston Celtics games. If you have any questions or concerns before or after an event, please call our Guest Services department at 617-624-1331, Monday through Friday during normal business hours or email [email protected]. If you have questions or concerns during the event, please seek out the nearest Guest Services Team Member, Security Officer, or visit the Guest Services located on Level 4, near Loge 4 or the Guest Services booth on Level 7. TD Garden has a no re-entry policy during events. Guests who need to exit and re-enter due to personal emergencies (i.e. retrieve medicine from vehicle), must first make contact with a Guest Services Supervisor in Guest Services at Level 4 Loge 4 to make necessary arrangements. TD Garden has a no refund, no exchange policy on tickets for all events. Exceptions may apply. Aside from general concessions, Delaware North SportService provides our upscale dining and services. Private restrooms in each suite. There are also general restrooms available for use on each level. Baby changing stations are located in every restroom. A Family Restroom is available inside First Aid on Level 4 near Section 15/16. TD Garden updates the event calendar as soon as events are confirmed. You may access our detailed seating charts by visiting our seating page. TD Garden is a smoke free facility and smoking is not allowed anywhere in the arena. Vape Pens or similar are not allowed inside the arena and may be confiscated. To learn more about sponsorship opportunities at TD Garden, please contact our Corporate Partnerships department at 617-624-1835. The Sports Museum is a 501(c)3 non-profit educational institution that has served Boston and New England for the past 40 years. Founded in 1977 and housed on Levels 5 & 6 of the TD Garden, The Sports Museum features a half-mile of exhibits celebrating the history and character of Boston sports, including the teams that play in TD Garden and the others that make Boston the envy of the sports world. TD Garden asks all guests to remain seated during events. Depending on the demographics of the event (such as concerts), standing may be accepted as normal protocol. Guests are permitted to stand if the majority of the audience is doing the same. Standing on seats or any other building structure is not permitted and may result in eviction from the event. As a courtesy to your fellow ticketholders, we ask that, during sporting events, guests refrain from walking around in the seating area until there is a stoppage in play. The Guest Services Team Member in your section will ask that you stand to the side of the entryway into the arena bowl and let you know when you are able to go back to your seat. We thank you for complying with this policy. TD Garden’s Sportservice has begun implementing The Last Straw Campaign – a Delaware North initiative that seeks to curb excess plastic waste by offering drinking straws on a request-only basis. All concession drinks will be served straw less unless requested, in which case fans will receive paper straws. Delaware North and its six operating subsidiaries, including TD Garden, hope to sustain The Last Straw Campaign and cut down on the estimated 38.1 million plastic drinking straws the company served in drinks to guests in 2017 at its locations around the world as part of its proprietary environmental stewardship program, GreenPath®. If necessary, guests may bring strollers to events at the arena. Strollers are not allowed on the concourse or in arena seating and must be checked at the Guest Services Office on Level 4, near Loge 4. TD Garden is not responsible for any lost, stolen, or damaged strollers. For some events, Executive Suites may be rented to entertain guests and clients. For more information about Executive Suite rentals, please call 617-624-1847 or visit our Premium Seating section. TD Bank, America’s Most Convenient Bank®, is one of the 10 largest banks in the U.S., providing more than 9 million customers with a full range of retail, small business and commercial banking products and services at more than 1,200 convenient locations throughout the Northeast, Mid-Atlantic, Metro D.C., the Carolinas and Florida. In addition, TD Bank and its subsidiaries offer customized private banking and wealth management services through TD Wealth®, and vehicle financing and dealer commercial services through TD Auto Finance. TD Bank is headquartered in Cherry Hill, N.J.
To learn more, visit TDBank.com. Find TD Bank on Facebook at facebook.com/TDBank and on Twitter at twitter.com/TDBank_US. TD Bank, America’s Most Convenient Bank, is a member of TD Bank Group and a subsidiary of The Toronto-Dominion Bank of Toronto, Canada, a top 10 financial services company in North America. The Toronto-Dominion Bank trades on the New York and Toronto stock exchanges under the ticker symbol “TD”. To learn more, visit TD.com. Visit the TD Bank Service Kiosk inside North Station for general assistance with your TD Bank account, as well as to learn more about the products and services TD Bank offers. Four ATM’s are also available in North Station for your convenience. Join TD Garden Insiders to receive presale access to select shows, exclusive ticket packages, and more. Tickets for events at TD Garden may be purchased at the following authorized points of purchase: in person at the TD Garden Box Office, at Ticketmaster.com, or at a Ticketmaster Outlet. Click here for more information on purchasing tickets. Note: there are no ticket printing devices located on the concourse. Consumer Warning – TD Garden uses bar code scanning for ticket admissions. As a result, fans should be careful when purchasing tickets and should ensure that the seller is a TD Garden licensed ticket seller, such as the TD Garden Box Office, all Ticketmaster outlets, Ticketmaster by phone, and Ticketmaster.com. Otherwise, you may be purchasing a ticket that is invalid and will be denied admission. Ticketmaster surcharges cover the costs of performing the administrative functions necessary to process ticket orders, as well as for shipping. There are three ways to purchase tickets through Ticketmaster. If you choose to use Ticketmaster’s phone or Internet service, you will be assessed a facility fee, a convenience and shipping charge. If you choose to utilize a Ticketmaster outlet to purchase tickets, you will be assessed a facility fee and a convenience charge. You may avoid Ticketmaster charges only by purchasing tickets in person at the TD Garden Box Office. Guests are advised that the only authorized sales agents for TD Garden tickets are the TD Garden Ticketing Department, TD Garden Box Office, Ticketmaster and TD Garden event promoters. The only authorized ticket resale services for TD Garden tickets are Ticketmaster verified sites. Tickets purchased from any other sources may not be valid. TD Garden is not able to honor, replace, or refund invalid tickets. Invalid tickets/barcodes will be confiscated by TD garden Box Office after an invalid scan. A Copy of the ticket will be provided at the customer’s request. A copy of the invalid ticket may be used to alert the point of purchase. Guests with invalid tickets are welcome to purchase new tickets at TD Garden Box Office, but seat inventory, location and price is based upon availability. Guests are strongly encouraged to report counterfeit ticket sales to the point of purchase and to consumer protection agencies such as the Massachusetts Attorney General Consumer Protection Hotline, at 617-727-8400. The hotline is staffed Mon-Fri, 10:00 AM to 4:00 PM. If guests have information about the selling of counterfeit tickets, they are also encouraged to contact Boston Police. Individuals wishing to provide information anonymously may do so by calling the CrimeStoppers Tip Line at 1-800-494-TIPS or texting the word ‘TIP’ to CRIME (27463). Private tours of TD Garden are not given, however, The Sports Museum, located on Levels 5 & 6 of TD Garden, offers guided tours to visitors. Museum Assistants will guide guests to Level 9, the top floor of TD Garden, where they will be eye level with the Boston Bruins and Boston Celtics championship banners. Guests will also be guided through The Sports Museum, which displays the rich heritage of Boston sports and the influence of sports on the social history and evolution of Boston. Public Tours, Private VIP Tours, and Field Trip Tours are available. The Sports Museum also offers TD Garden Arena Tours only in the NBA and NHL offseason until Labor Day. For more information on the tours, hours of operation, and pricing, click here. Use of movie cameras and video or audio recording equipment is strictly prohibited by event promoters, and TD Garden reserves the right to confiscate any tape or film. Guests may request a complimentary cup of water at any concession stand located within TD Garden. Additionally, guests may visit the Guest Services Office on Level 4 outside of Section 4 or the First Aid Office on Level 4 outside of Section 15/16. Guests, including law enforcement personnel not present in an official capacity, are prohibited from bringing weapons into the arena. TD Garden does not provide lockers of any kind. Visit the policies page for more information about TD Garden policies. Wheelchair Escorts are available for disabled guests who may need assistance getting to or from their seat. Our escorts will meet a guest at the entry doors and assist them to their seat as well as meeting them at the end of event and escorting them to the nearest exit. For more information, please call Guest Services at 617-624-1331. The Will Call window, located at the TD Garden Box Office, is for Ticketmaster purchases, team, and internal reservations marked for will call. The Will Call window opens two hours prior to any event. Will Call tickets are available on the day of event only. Guests picking up tickets will have to provide photo ID and the credit card used in the purchase to obtain the reservation.